Ceramic materials that are specially developed for use as medical and dental implants are termed bioceramics. 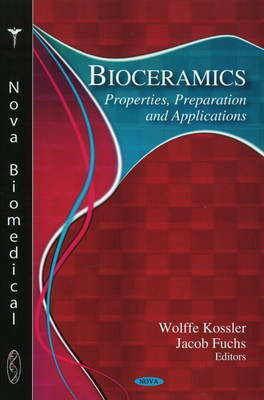 Bioceramics can have structural functions as joint or tissue replacements, can be used as coatings to improve the biocompatibility of metal implants, and can function as resorbable lattices which provide temporary structures and a framework that is dissolved, replaced as the body rebuilds tissue. Some ceramics even feature drug-delivery capability. This book presents current research and cutting edge thinking in this field. It begins with an overview of the significance of calcium orthophosphates for humankind, specifically for dental and bone grafting applications. The development of granulate systems of calcium phosphate-based drugs with controlled drug release kinetics is examined as well. This is an increasingly important area of research because of the prevalent rates of infection in bone and dental surgery. In order for bioactive glasses or ceramics to bond to living bone, the formation of a bone-like apatite layer on their surfaces must occur. This book also presents two different methods for the synthesis of these bioceramic materials.